Soak green (French) lentils in water for 4-5 hours. Then drain. In a pot, take olive oil and onions. Saute over medium heat and stir in carrots and garlic. Saute for 8-10 minutes. And then, stir in green lentils and cook for a while. Add hot water+bouillon (meat stock), tomatoes and salt. Simmer over low-medium heat with the lid closed, till the lentils get soft (for about 30-40 minutes). Turn the heat off and add black pepper and summer savory. 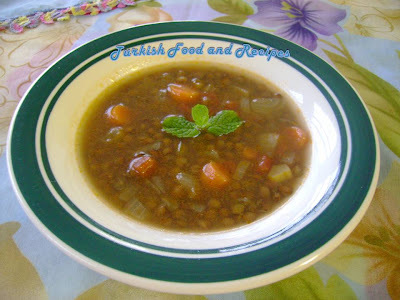 Serve Green Lentil Soup warm or hot. Mercimegi onceden su icinde yaklasik 4-5 saat bekletin. Sonra suyunu suzun. Bir tenceye sogan ve zeytinyagini alin, orta ateste sote edin. Havuc ve sarimsagi ilave edin yaklasik 8-10 dakika kavurun. Mercimegi ilave edin ve biraz cevirdikten sonra sicak suyu, domates ve tuzu ekleyin. Mercimek pisene dek yaklasik 30-40 dakika kisik ateste kapagi kapali olarak pisirin. Altini kapatin, karabiber ve zater otunu ilave edin karistirin. Yesil Mercimek Corbasini sicak servis yapin. Çok güzel,leziz ve sağlıklı bir çorba yapmışsınız ellerinize sağlık.